Five hundred years ago today, Martin Luther started a movement. Like Luther, many believers in his day were infuriated by all the corruption that had crept into the church. But it wasn’t until Luther provided the language to articulate their frustrations that the Reformation was born. Similarly, millions of today's believers are disillusioned with our current form of church. According to Christian author Phillis Tickle, it’s probably because the church is due for another great revival of some kind. Perhaps it’ll be a new reformation. Hopefully, it’ll be a full-on revolution. But whatever it is, those of us who are frustrated with today’s form of church need to find the right language to discuss it. Otherwise, we’ll never be able to articulate everything that’s wrong with the institutional church model. Nor can we clearly explain why we need to get back to a more biblical example. In order to contribute to this growing conversation, I’ve already created several animated videos, a book, and a podcast. But today I’m announcing a very special project, something I wanted to do long before the videos, the book, or the podcast were ever conceived. In short, I’m creating a comic book. And soon, I intend to share it online, in the hopes that others will share it too. My goal is to use this highly sharable medium to help connect even more believers who long for a church experience that looks less like a corporation and more like a genuine community. Here are some of the finished pages of my upcoming comic book. I hope you enjoyed this little sneak peek at my upcoming comic book. More pages will follow soon. Also, you should know: this project is just one part of a larger mission. Not only do I want to help believers articulate what kind of church community they’re looking for but, whenever possible, I'm also trying to connect them with other believers who are looking for the same thing. To that end, I’ve asked folks to sign up for my email list and join our ever-growing Facebook group. I’ve also hosted a couple of live events, and am currently planning more. Already, several new friendships, fellowships, and a number of new house churches have formed as a result of these efforts. And I hope to see much more fruit like this in the near future. So, if you’d like to be notified once the full version of the comic book is published, or when there’s another meetup event, please sign up for my email list here. In the meantime, please check out some of the great resources listed below. And if you think this conversion is important, please forward the link to this post to all your friends. Please watch this video. If it strikes a chord with you, you’ll probably want to binge-watch the rest of my videos, which you can find here. Make sure you listen to this first episode of the podcast. My bet is: you’ll be hooked. If so, you can listen to more episodes online or on iTunes. You can also find it on Google Play. This is my magnum opus. 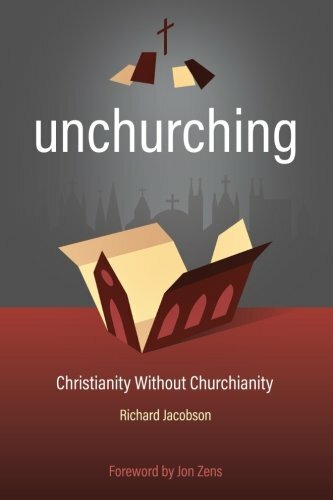 Whereas I can only touch on shorter topics through other media—a four-minute animation here, a thirty-minute podcast there—this book is a thorough deconstruction of the organized church model, as well as a more biblical vision for genuine church community.